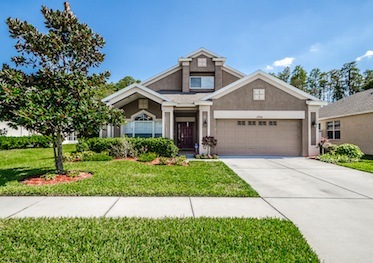 From Lakeshore Ranch’s gated entry & graceful waterfall, to the community fishing pier, stately clubhouse, fitness center, park, playground, tennis courts, 3 pools (lap, kiddie, resort), basketball courts, & dog park; you’ll feel right at home. This exquisite Sunset Bay Drive residence is the epitome of a stunning subdivision. With 4 Bedrooms, 2.5 Baths, plus office/den with French doors & a loft area w/ adjacent bath, it is the ideal family home. 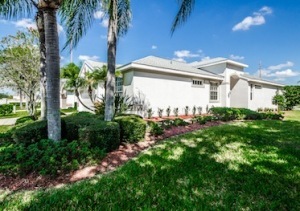 At approximately 2,398 square feet & constructed in 2007, this beautiful property is edged in perfectly tended shrubbery. A fenced back yard brings the picture full circle. Impeccably maintained, each room is a showcase. A barrel ceiling in the grand foyer lends drama, while the kitchen is splendidly appointed with the finest of finishes. Contemporary appliances shine, a charming breakfast nook beckons. A Great Room lends itself to the modern lifestyle as it opens onto the kitchen and boasts sliders to the outdoor entertainment area. It’s separated from the Formal Dining room with a gently arched, oversized doorway across from the loft’s staircase. The covered lanai looks out over the gently rolling & verdant yard. Each bedroom is impeccable, with the master suite featuring a unique shape, private entrance to the lanai, a deep soaking tub, separate glass shower stall, gleaming countertop with dual sinks, tons of cabinet storage, & recessed lighting. Lush carpeting & cool tile flow throughout this home, which also features natural gas & HOA fees at $228/quarter. 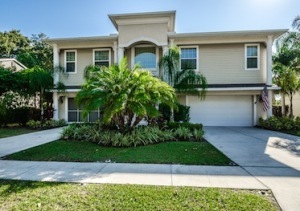 Low Maintenance Villa in Gated Trinity, Florida Community! Fox Hollow in Trinity is home to some of the area’s most sought-after subdivisions; the gated community of Upper Montclair is one. Nestled on an oversized corner lot that is just over .25 acres is this beautiful 2 Bedroom, 2 Full Bath, 2 Car Garage home plus den/home office. A lovely assortment of trees and shrubbery accent the exterior. The oversized, screened lanai is vaulted; creating more of a wide, open feel with views of the scenic neighborhood, yet still presenting plenty of room to furnish a private outdoor retreat. Clean lines, clever architectural niches, and soaring ceilings welcome you to the home’s interior. The spacious foyer is adjacent to the sunny home office with its set of classic French doors. This room would also make for the perfect library or tranquil sitting room. A cool, airy feeling throughout is provided courtesy of the Great Room plan. The appealing kitchen is spacious with tons of cabinetry/counter space, a flush-mount stove top, pantry, recessed lighting, and a breakfast bar for casual dining, in addition to a windowed breakfast nook offering views of the lanai and the living room. Both baths are immaculate with lovely finishes, while the master bath boasts an indulgent garden tub, dual sinks, a separate shower stall, and ceiling height peek-a-boo windows that provide light and a dramatic flourish. With its recently painted exterior, new roof in 2014, and newer A/C in 2010 all you’ll need to do is move in and then lounge on a chaise by the heated community pool. https://trinityeastlakerealestate.com/wp-content/uploads/2018/03/LC-WebLogo-340x156-300x138.png 0 0 loricrawford https://trinityeastlakerealestate.com/wp-content/uploads/2018/03/LC-WebLogo-340x156-300x138.png loricrawford2014-10-16 20:55:252014-11-19 20:48:25Low Maintenance Villa in Gated Trinity, Florida Community!